Why throw out all those tiny little cane ends? You can still use them, even if there’s not enough for a large project. I’ve been making these little flower head pins ever since I began making my own canes. For those of you who don’t already know, I have a thing for flowers. I LOVE them. But … I live in the woods. Flowers don’t grow well here. So instead, I made a TON of flowers in the spring & summer months from clay. This project is a fun & quick way to use up those wonky ends & slices you may have cut from your canes. Placing these flowers on longer pieces of wire will allow them to be used as plant pokeys, tied into the center of a bow for a gift, jewelry head pins, and so much more. What Kind of Cane Should You Use? In the example photos, I have used my petal canes. You do NOT need to use petal canes for this project. You can use kaleidoscope canes that you have cut into sections (this would be lovely). You can use bullseye canes, jellyroll canes, or any cane that you have on hand. Because these are relatively free-form, you can use a wide variety of canes. Don’t limit yourself & try to make all sorts of flowers. First gather your old canes that you want to use up, but aren’t big enough for a project. — OR — Gather your wonky cut cane slices. If you’re using an old cane and not slices, you’ll ned about 6-8 slices per flower. Cut approximately 2-3″ of 20 gauge wire. 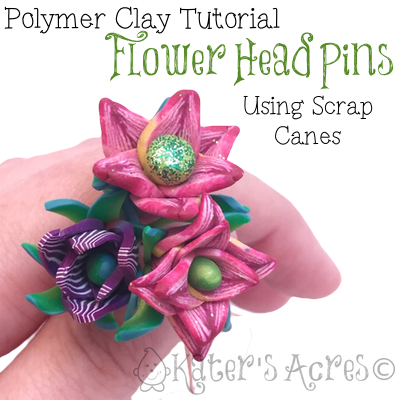 You’ll need ONE 2-3″ section per flower you are going to make. On the end of a piece of wire, add a drop of Bake & Bond. Form a teardrop of clay in a contrasting color. Place the teardrop (pointy side down) onto the wire. Next add your petals onto the pointy side of the teardrop with each petal overlapping the previous petal. NOTE: I like to start with 3 petals in the center, but you can choose what looks best to you. Add a second layer, with the petals in the “open spaces” between the first petals that you placed. Gently “squeeze” the petals around the teardrop to ensure they are secure and that they won’t break off. TIP: I like to gently “spin” the flower back and forth in my thumb and index finger to do this. If you want to add some leaves, add them to the bottom of the flower coming up to the top. Place in a jar with the flowers sticking UP. Bake in a dedicated polymer clay oven for 45 minutes at the recommended temperature for your brand of clay. Once they are cool you should have about 2″ of wire on the end. You can use these as headpins for a jewelry project, loop the wire to make an ornament, stick as is in a potted plant, and so much more. What a GREAT article; thanks for the link-back. Be sure to check it out!